PMS - premenstrual syndrome - is estimated to affect some 40 percent of women between the ages of 14 and 50. PMS is a very real condition. Women suffering from PMS are not weak, nor neurotic and the illness is not "all in the head." This condition is anything but a joke. If you suffer from PMS you know when it hits you, life can be really unplesant. PMS usually involves a combination of pain, altered mood and temporary weight gain. PMS is an individualized condition. One woman's PMS will probably not be identical to another woman's PMS. Common symptoms include fluid retention, depression, tension, headaches, tender swollen breasts, clumsiness, irritability, and food cravings. Symptoms can occur two days to two weeks before menstruation, and some women experience symptoms so severe their day-to-day functioning is impaired. Until recently little could be done for PMs sufferers, but now diet, nutrition, and lifestyle modifications hold out promise of relief. 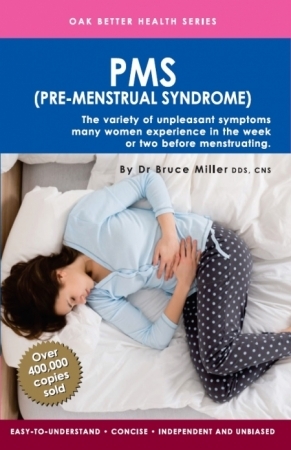 This book describes and outlines for you the natural approach to treating PMS.